Capital of the department of Haute-Garonne, France, where a large number of Jews lived as early as the beginning of the eighth century. In conformity with an old custom, and in punishment for some fancied crime, one of their number, generally the most respected old man of the community, was obliged to appear every Good Friday at the door of the cathedral to have his ears boxed in public. They vainly addressed a petition to King Charles the Bald in 850 to have this custom abolished; but it continued until the beginning of the twelfth century, when it was replaced by an annual tax payable to the monks of St. Sernin between All Saints' Day and the feast of St. Sernin, and by a yearly contribution of 44 pounds of wax, to be delivered on Good Friday at the Cathedral of St. Stephen. In the thirteenth century the counts of Toulouse were favorably disposed toward the Jews on all occasions, and granted them the right of acquiring real estate without paying rent. 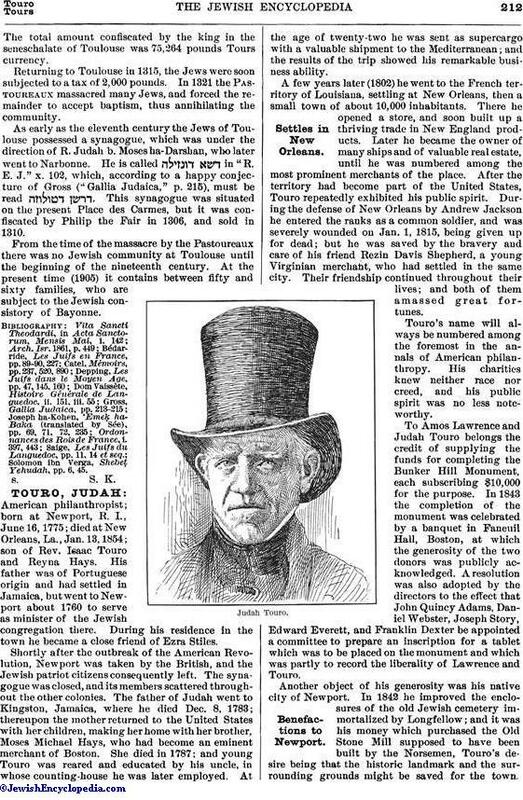 Many estates were held by two prominent Jewish families, one represented by Espagnol and his sons Solomon and Provençal, and the other by Alacer (Eliezer) and his sons Abraham and Belid. In 1242 Raymond VII. granted the Jews the right of freely disposing of their property, and of selling, mortgaging, or leasing their farms, estates, and seigniories on condition of paying a tax of 12 Toulouse deniers on each pound of the sale price and 6 deniers on each pound of the rent; but in 1290 King Philip the Fair took action against those Jews who had surreptitiously obtained letters of exemption from the taxes imposed upon them. In the district of the seneschal of Carcassonne a special judge was appointed to take charge of the cases in which Jews were interested; but in Toulouse the Jews were tried before the same judges as the Christians. Philip the Fair confirmed this arrangement in 1304 by decreeing that the regular judges should handle all Jewish cases, whether civil or criminal. Several Jews who were arrested in 1306 accepted baptism rather than leave the city, but Solomon ibn Verga goes too far when he says that the whole community was converted.The total amount confiscated by the king in the seneschalate of Toulouse was 75,264 pounds Tours currency. 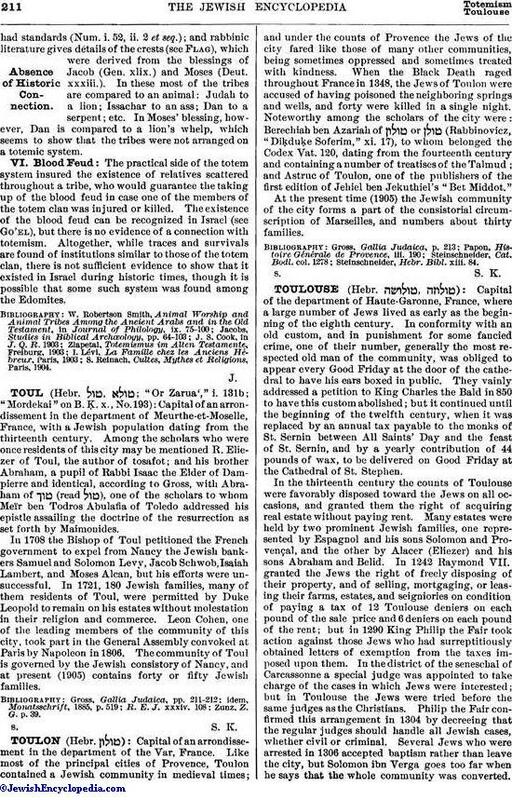 Returning to Toulouse in 1315, the Jews were soon subjected to a tax of 2,000 pounds. In 1321 the Pastoureaux massacred many Jews, and forced the remainder to accept baptism, thus annihilating the community. As early as the eleventh century the Jews of Toulouse possessed a synagogue, which was under the direction of R. Judah b. Moses ha-Darshan, who later went to Narbonne. He is called in "R. E. J." x. 102, which, according to a happy conjecture of Gross ("Gallia Judaica," p. 215), must be read . This synagogue was situated on the present Place des Carmes, but it was confiscated by Philip the Fair in 1306, and sold in 1310. From the time of the massacre by the Pastoureaux there was no Jewish community at Toulouse until the beginning of the nineteenth century. At the present time (1905) it contains between fifty and sixty families, who are subject to the Jewish consistory of Bayonne. Solomon ibn Verga, Shebeṭ Yehudah, pp. 6, 45.